Costa Rica is a country that is gifted with many rivers, but one of the most picturesque and accessible of them all is the Pacuare River. This mighty river easily stands out as it flows through diverse landscapes including rainforests, canyons and waterfalls. Various types of wildlife like sloths, monkeys and different kinds of birds call Pacuare their home. This river is nestled on the Caribbean slope of the country and is bordered by the Talamanca Mountain Range. It is the ancestral home of the Cabecar Indians. 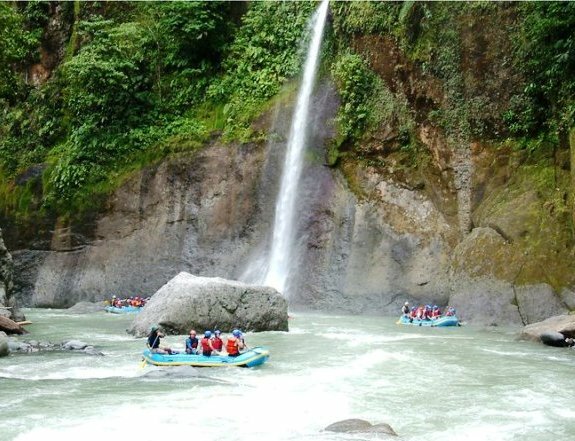 Many visitors who come to experience Pacuare do it through the exhilarating sport of white water rafting and for good reason. Boasting a range of rapids that goes up to class IV, thereís no denying that this particular Costa Rica River is the premier spot for white water rafting in the entire country. Even the reputable National Geographic hails it as one of the world’s top 10 river trips. White water rafting on the Pacuare is an unbelievable experience not only because of its fast and furious rapids. 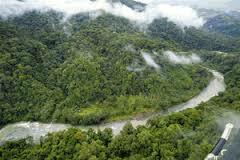 It is also because the trip unveils the stunning scenery that surrounds the river shore. 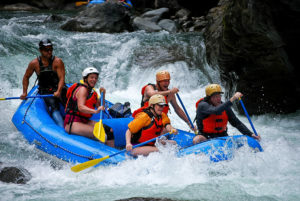 A word of warning though – to enjoy whitewater rafting on the Pacuare, you will need to have some experience in the sport, and of course a very adventurous spirit. There are about 19 miles of white water belonging to the Class III to IV categories that are waiting to be conquered. Several outfitters offer various whitewater rafting packages. They will provide you with the essential equipment include paddles, a helmet and life jacket. The tour will also be headed by a very experienced guide who will give a safety orientation before commencing with the whitewater adventure. Most tours will begin by taking you through Class II-III rapids to allow you to be more comfortable with navigating the river and gaining confidence and team work along the way. 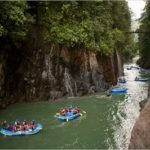 But soon enough, you will have to tackle the Pacuare River Gorge, famous for having the best white water stretch in Costa Rica. The gorge, which stretches to 5 miles features rapids with creative nicknames like “Double Drop”, “Upper and Lower Huaca”, “Pin Ball”, and “Terciopelo Snake”. After the gorge, you will go into another popular section called Valle del Pacuare. Here, the river opens up more for 5 miles, and offers more fun rapids like the “Magnetic Rock” and “Play Hole”. Depending on your outfitter, tour cost can include round trip transportation as well as breakfast and lunch. If you are ready for the ultimate rafting adventure, make sure to bring the essentials like comfortable footwear, preferably sneakers or sandals with straps; sun protection and a change of clothes as you can expect to get really wet! Rafting trips here are conducted several times during the day. A typical white water rafting tour lasts for the entire day, and includes an exploration of the nearby waterfalls, springs and hiking trails. One of the possible waterfalls you will visit is the spectacular 150 foot Huacas Waterfall. 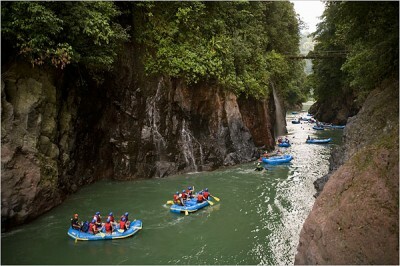 And if single-day rafting is not rough and adventurous enough for you, take the option of going for an overnight trip! This adventure will still have all the exciting rapids, but with an added bonus – staying in rustic eco-lodges. 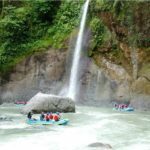 If you are not much of a rafter; don’t worry, you can still enjoy the Pacuare in a two or three-day tour where you can explore remote locations, swim and visit waterfalls and canyons.